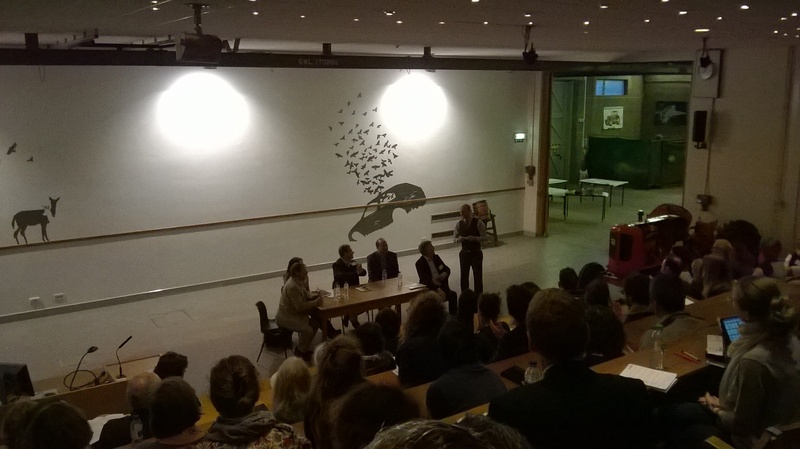 The symposium started, on 1st September, with a general introductive session touching upon some this general questions at the heart of the anthropological discipline and were discussed by Tim Ingold, David G. Anderson, Gisli Palsson and Amiria Salmond. It was followed for the next three days by distinguished keynote speakers and panelists like Christina Toren, Stephanie Bunn, Colin Scott, and participants like Myrdene Anderson to name a few! It has been a four days marathon, for about 10 hours a day, of thinking and discussing about these theoretical questions that totally filled our minds with deep thoughts. We can’t remember many of so deeply inspiring scholarly exchanges in our academic life as this one. Many of the participants felt that we were all part of a gathering that might become important for the history of our entire discipline. 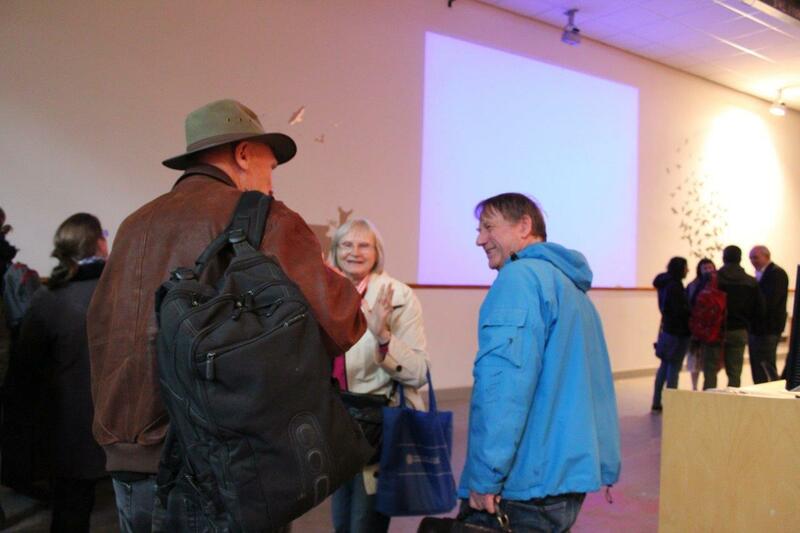 In the picture, Tim Ingold and his wive Anna discussing with Colin Scott. As the symposium was unfolding it became clear to many of us that Tim Ingold’s work had really reached out far beyond the disciplinary boundaries of anthropology, as the conference had brought together some of the world’s finest scholars also from many other disciplines such as arts, art history, architecture, archaeology, literature studies, psychology – to name but a few. But as important as that, it became also clear that anthropology as we know it got broadened into new directions through Ingold’s work. In his talk Ingold emphasised how he would like to see our discipline really as an open discipline, and one that is not afraid to ask brave, grand and fundamental questions about life on this planet. In his final words he made it very clear that our enquiry is about life in the ONE WORLD we all jointly inhabit. Focusing too much on different ontologies, he argued, would favour the creation of different worlds – which in the end do not talk to each other anymore. Rather than ontology, instead, we should focus on ontogeny, which allows us to analyse processes of becoming, of coming-into-being, of growing in the one but heterogeneous world we live in. These enquiries should continue to be comparative, because rather than one final solution there is always a multiplicity of paths we can follow. If we want to find out why somebody follows one path rather than another, we should know something about all those possible paths. However, we enjoyed how in this symposium many of the discussions pushed anthropology really to the edge of what many of us thought our field is about. Almost after each substantial paper the questions reached a maximum depth, and reminded us of a quite principal dilemma: we know that many of the dichotomies with which we work do not really hold when we go out and experience real life. The borders between the human and the animal, the human and the non-human, the alive and the dead, the animate and the inanimate, and really any dichotomy we work with – do not really hold when we expose them to radical empirical enquiry. On the other hand – however – as much as we attempt to overcome these dichotomies, we always rebuild them again in the next available context. This led Martin Mills in the final discussion to ask that why is it that our brain always longs for solidity, finite objects, and certainty, if we have come to understand – not least through Tim Ingold’s work and the discussions that followed – that actually everything around us and we ourselves are involved in processes of becoming. Maybe it is that if we abandon the idea of dichotomy altogether, we cannot deal with causation anymore. You need to have a dichotomy in order to say that something causes something else. Once you arrive at that point there is not much else you can say, can you? Maybe this is actually what is important to remind ourselves, as Ingold has reminded us in the end, “anthropology is an open discipline”. We have found out the hard way that final solutions can have the most disastrous effects our planet has ever seen. So let us continue looking at life and experiencing it as openly as possible, at the same time acknowledging our own limitations: our brain works with concepts that are maybe simpler than what we see in the world surrounding us. This entry was posted in All, conferences, Theoretical Issues and tagged Aberdeen, Tim Ingold. Bookmark the permalink.